Without four good feet to stand on, your horse is in trouble. No matter how well bred, athletic or personable he may be, he’ll never reach his full potential if his feet can’t hold up. While genetics do arguably play a role in equine soundness and foot quality, conscientious owners will also do everything they can to give their horses the best hoof care. This means providing a complete and balanced nutrition program designed to meet the horse’s age, use and activity level, along with professional hoof maintenance that includes regular trimming, and, if necessary, shoeing. It’s also important to use the right hoof care products at the right times, which depends greatly on where and how your horse lives. “Environment plays a big role in both hoof condition and how quickly the feet grow. The horse’s feet will generally mirror the environment he’s in. If it’s a dry environment, the feet will usually be hard and rigid. If it’s a damp, muddy environment, the feet will usually be soft and overly pliable, which can lead to wall separation, excessive flaring and leave the sole susceptible to bruising,” notes Jason Maki, a certified journeyman farrier who works at the College of Veterinary Medicine Large Animal Teaching Hospital at Texas A&M University in College Station, Texas. Maki has been a farrier since 1997 and has been at Texas A&M since 2008. Visit your local tack and supply store, or do a little online shopping, and you’ll find a wide array of hoof care products available. Take Maki’s advice and consider your horse’s environment, along with overall hoof condition, when choosing a product. You should also ask your hoof care professional, as he/she is the perfect person to give input as to whether or not your horse needs a particular type of product. When using any hoof care product, read the complete label and always follow directions exactly. Let’s say it’s the rainy season. Your horse has a nice, dry stall at night, but his turn-out area is a muddy mess, and the arena where you do most of your riding isn’t much better. Under these conditions, your horse’s feet can absorb too much moisture, which can seriously compromise hoof integrity, leaving feet soft and vulnerable. What about the horse living in an arid climate that spends his days on hot, sandy soil? Those conditions often cause a horse to have hard, dry feet. Some horsemen use the old tactic of letting the water tank over flow just enough to dampen the surrounding ground. A more direct and thorough method is regular application of a good hoof dressing that is designed to add moisture and help the hoof retain it. Many horses live in regions were the ground is dry, but the climate has significant humidity, and this presents another type of problem. When using any hoof care product, read the complete label and always follow directions exactly, including frequency of use. Certain products, such as hoof hardeners or thrush treatments, contain ingredients that work extremely well when used properly, but can cause problems if applied incorrectly. Some products are intended for routine use, while others are made to address a specific problem, such as thrush. Before applying any hoof product, you want to start with clean, dry feet. Stand the horse on a dry surface with safe footing. 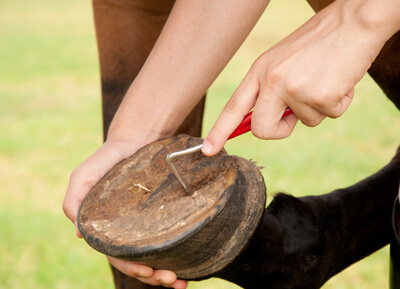 Clean the hooves thoroughly, using a hoof pick and brush off any remaining dirt and debris. Then apply the hoof care product according to specific label directions.